Do Your Civic Duty for $8,000! The Honda Civic has been an icon of frugality for decades. Today, Nice Price or Crack Pipe has a decades-old Civic that comes with a price that may seem less than frugal. Yesterday's Audi Doody, didn't pull your strings as it, and it's $15,000 starting price, tipped the scales to a surprisingly close 54% Crack Pipe vote. Today we have a car that's not quite as old, nor quite as expensive, and not nearly as rare. Honda. If you the type who demands the utmost in reliability, but is as yet unwilling to buy a Toyota, and hence sell your soul to the satan of boredom, then Soichiro Honda's your man. Well built, and still with a semblance of character, Honda's products have gained an envied reputation. And what a depth of products they offer- everything from lawn mowers to ATVs and motorcycles, to cars, light trucks, even business jets. And for the past 37 years they've built the typically humble, occasionally hot, Civic. Introduced as the solution to the gas crisis plaguing the nation, the two-box Civic was the first car Honda had designed with the U.S. market in mind. Not only was it fuel efficient, but the wickedly brilliant 3-valve CVCC four cylinder- introduced in 1975 - managed to meet the new, and at the time extremely stringent, U.S. emissions standards without a catalytic convertor. Leaded gas FTW! That first generation Civic became beloved by owners, and lasted until 1979, which is the year from which today's car hails. You still see first-gen Civics on the road, a testament to their durability and their attractiveness to their owners, but few are as nice as this three-door hatch. The seller has given the 1,488-cc powered car a full refreshening both inside and out, and details the respray in the ad for your pleasure. New Houndstooth upholstery and a rebuilt 20K-mile replacement engine complete the package in this 99,000-miler. The CVCC put out 60 ponies this year, but at less than 1,500-lbs, the car is good for both around town and, with that five speed, decent highway cruising. And it should also be good for damn-near 50-mpg on that highway. Now, all this goodness does come at a price, and in this case that's $8,000. That's a lot of cheddar for a 30-year old econo-box, and nearly twice what the car cost new. But if Civics class taught us anything, it was that the more people find you desirable, the more they'll be willing to pony up for you. 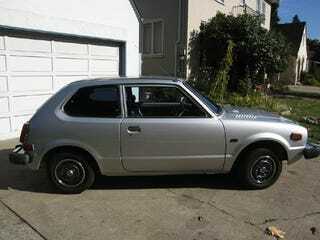 So, are you civic-minded enough to drop eight large for this silver Civic? Or, does that price move this car out of your civic center?